The basketball court is divided into two halves at every level of play. Once a team advances the ball into the half court in which their goal lies, no player on that team is allowed to bring the ball back over that line. Unlike sports such as soccer and hockey, basketball does not allow its players to escape defensive pressure by retreating backward. 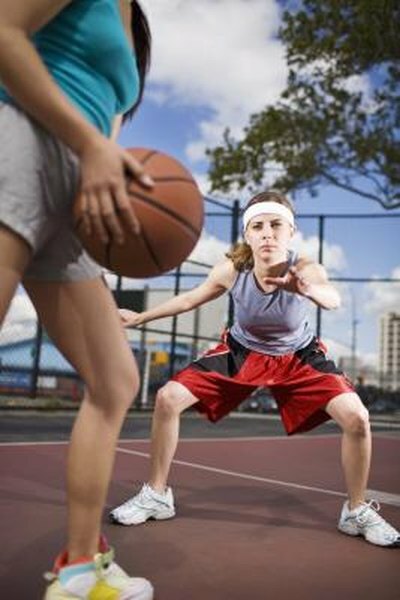 This feature helps to make the game of basketball a high-scoring and fast-paced game. This rule reads that no team shall be in continuous possession of the ball for more than 10 seconds in its own half of the court. This rule is the standard at almost all levels of play from junior and high school basketball up to NCAA and professional women's basketball. If a team fails to advance the ball past the half-court line in 10 seconds, they lose possession of the ball. The opposing team then gets to throw the ball in bounds at the half-court line, having to pass the ball into the front court. There are three exceptions to this rule that will award the offense a new 10 seconds: If the defense punches or kicks the ball, if a defensive player is assessed a technical foul, or if the defense is issued a delay of game warning, the 10-second clock is reset. The NBA has a shorter limit on the amount of time a team has to advance the ball into its front court. The NBA rule was previously 10 seconds, like the rest of basketball, but was reduced to 8 seconds at the beginning of the 2002 NBA season. Just like all other leagues, the offense will lose the ball if they do not advance it past the half-court line in that 8 seconds. All exceptions to the rule are also the same. Due to the athleticism and passing strength of NBA players, this rule typically does not effect the normal course of play. However, the defensive team gets an advantage during "crunch time" situations when they apply full-court pressure. With time running down on the 8-second clock, the offense may be forced to make riskier passes and has an increased probability of losing possession. At all levels of play, the offensive squad may not bring the ball backward over the half-court line even if this is done by mistake due to an errant pass or a ball dribbled off the foot of an offensive player. If an offensive player is the first to touch a ball that has crossed back over the half-court line, his team will lose possession of the ball. The opposing team will then be awarded the ball at the half-court line. This rule does not apply during a loose ball, which may occur during a jump ball situation or during a rebound where an offensive player taps the ball out of a congested area. Once an offensive player gains possession and secures positive position with the ball, he may not dribble or pass the ball into the back court. If a defensive player knocks the ball loose from an offensive players possession, he may retrieve the ball in the back court with no penalty. How Long Does It Take for the Body to Absorb the Nutrients in Food?